Count the strings – one per note in the bass, two per note in the tenor, and three for the rest! All pianos naturally go out of tune. This is mainly due to a swelling and contracting of the different parts of the piano as they respond to changes in humidity and temperature. This affects the tension of the strings. There are approximately 200 strings in a piano, all of different lengths and thicknesses. These slight changes of tension will affect each one differently, gradually breaking down the careful alignment of their relative pitches. How can I tell if my piano is out of tune? At first, the change in the tuning of your piano may be slight and can be described as a minor ‘unfocusing’ of the sound of individual notes. You may also find that at intervals such as fifths or octaves, your piano starts to sound less sweet. As the changes build up, chords start to sound discordant and the pitch stops matching across different sections of the piano’s keyboard. The overall pitch of the piano will also start to drop, making it difficult to play with other instruments or with recordings. How quickly this happens depends on the stability of conditions in the piano room, and the age and condition of the piano. An older piano is likely to go out of tune quicker than a newer one. A piano near a radiator or window, or a source of moisture such as the kitchen or bathroom will suffer greater changes in temperature and humidity, and so go out of tune quicker. How can I keep my piano in tune? If your piano is near a radiator, can it be moved away from it, or can the radiator be turned off? If your piano is near a window, does it receive direct sunlight? Can it be moved away, or the sunlight be blocked? Does the room itself tend to have large swings of temperature? Would another room be better for? In most houses with modern central heating systems these considerations are generally enough to keep a piano in tune for a long time. Other strategies for stabilising conditions would include dehumidifiers, either in the room or within the piano. A good cover can also help if the piano is unused for long periods. The most important thing for tuning stability is regular piano tuning. If your piano is tuned once or twice a year or more, then the string tension will be a lot more stable throughout the year, and it will start to go out of tune a lot less between tunings. 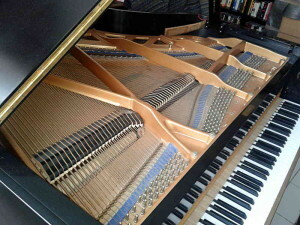 If you’re looking for a piano tuner in London, get in touch or book online today. I cover South, West, East and Central London boroughs. Use the form opposite to contact me via email. Please give as much info as you can about the piano, its age, recent tuning history if known, and your requirements and availability. Copyright © Phil Dickson 2019. All Rights Reserved.